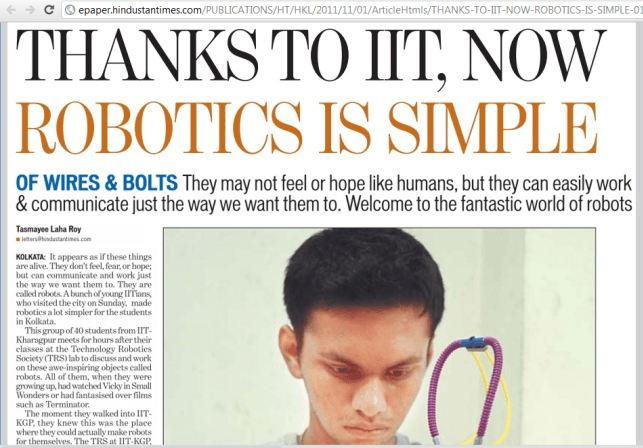 In the run – up to the annual fiesta that is Robotix held at Kshitij, Technology Robotix Society has lined up a series of events, workshops and exhibitions at various locations in the country. With the team spreading out to all corners of India, vast turnouts were witnessed at Bangalore, Nagpur and Ludhiana workshops held during the DP holidays. At the Kalyani hands-on workshop, students learnt to build a autonomous line following robot in a span of one day. In more recent news, the annual eagerly awaited Kolkata workshop, held at GD Birla Sabhaghar, in association with Kshitij, was a grand success. 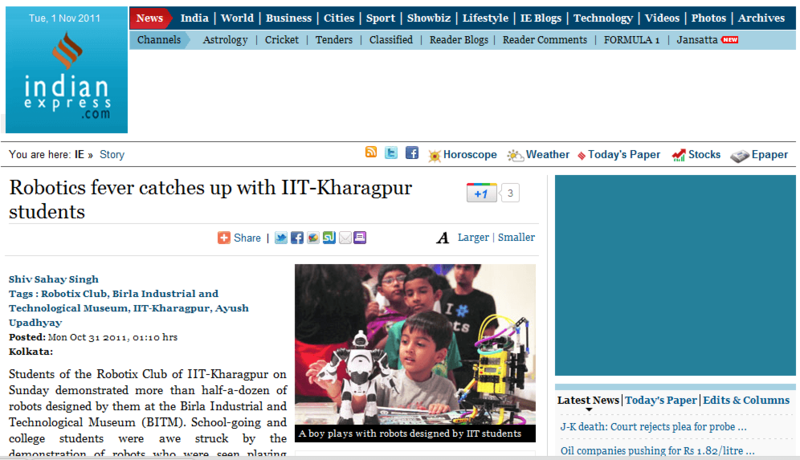 Hogged by media spotlights, Technology Robotix Society also held a demonstration of about 15 working robots at Birla Industrial and Technological Museum accompanied by a one-hour session on “Robotics for Beginners” specifically meant for school children which involved the explanation of the making of the simplest manual robot capable of traversal in 4 directions. As the floor was thrown open to questions, the audience, ranging across ages 5 – 50 were bursting with queries ranging from the exact platform for coding in Image Processing to the type of wire to be used for connecting various components of a robot. And we aren’t even close to the finish line! A hands – on Image processing Workshop will be held at Techno India, Salt Lake on 6th November 2011 and we’re in the final rungs of preparation.